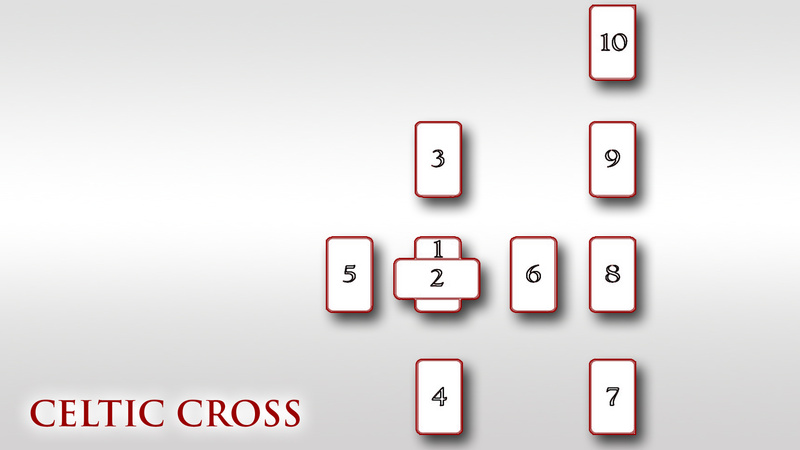 The following article tells how you can read the Celtic cross. The reading needs a set of 78 cards, your patience and the inspiration which can be found below. Reading that focuses on ones whole personality, the so called Celtic cross, is the eldest pattern of Tarot reading ever. It originates from the Middle Ages and since then it has undergone many changes. It is a mirror that doesn't leave out anything relating to human beings. We should use it prior to making important life decisions or in situations when we feel helpless. The reading summons up everything that we have done at our personal, professional as well as spiritual level. Shuffle the pack and focus on your "self". Split the pack into three piles and decide for yourself, which pile represents your body, which one your mind and which is the picture of your soul. Then shuffle each pile separately and concentrate on what each pile represents in the individual field. After that, shuffle the whole pack and remove the first ten cards from the top. The top card goes to position no. 1, next one to position no. 2, etc. Before you start reading the cards, it is good to know your personality life symbol as well as growth life symbol for this year. It will be easier for you to understand some context. If the cards are turned over, you are in the process of a change or you are determined to go ahead with the change. Royal cards can herald people, who will, like a mirror, show you your qualities and talents. Trumps or Major Arcana suggest a very strong potential for skills that you are currently using, especially with the appearance of a card that matches your life symbol. This means that any special help that you may get is determined by the position of this card. Subconscious mind - everything it processes - everything that is missing at the conscious level. What comes from your work and creativity - can they be the cause of some sort of a breakthrough? Once you have finished your Celtic cross reading, you can do an overview by arranging the ten cards you have selected, by their card colour. Wands will be the summary of what goes on at your spiritual level. Swords will reveal the overall picture of your mental positions, opinions and thoughts. Cups will show you, from a wider perspective, what goes on at your emotional level. Pentacles symbolise your overall feelings about the outer reality. Trumps - Major Arcana symbols - will point out the abilities and talents that are helping you on your way. Major Arcana symbols are archetypal energies that come out deep inside your soul. In difficult life situations, when I was at rock bottom and wanted to ask the cards for an explanation and help, several days before reading I tried to completely relax and concentrate on my own essence. Before I went to sleep, I tried to free myself from all real problems - I used a system like on a computer, whenever I thought of a real issue, I put it in the bin. Once I felt completely relaxed, I was thankful for all the life tests that I experienced, asked everyone I hurt for forgiveness, forgave everyone who hurt me and in the end I forgave myself. I repeated this ritual for several days and then I read my cards, which helped me deal with the problems step by step.